There is some good news after all the disappointment over killings of tigers in India. According to the latest census, the number of tigers is increasing in many states in India. But wildlife experts are stil alarmed over conservation efforts, which are hampered by rampant poaching and construction of infrastructure projects in forest areas. While the source population has been better protected in most states since 2006, the offspring dispersing to areas beyond the core sanctuary fall prey to human development. But the gradual increase in the number of the big cats is primarily due to some measures taken by the states. Some new sanctuaries have been declared, and they are in strategic locations for breeding and safe dispersal of tigers. There is a lot to be done by the authorities for other animals too. Over 617 national parks and wildlife sanctuaries in India that are home to several critically endangered species, get a very little money each month while the largest chunk of money goes to the tiger conservation fund. 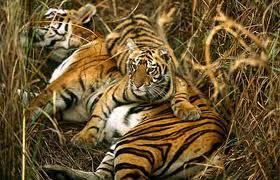 While it is very important to save the tiger, it is equally important to save other endangered animals.